January | 2011 | ifindkarma. elegance is refusal. 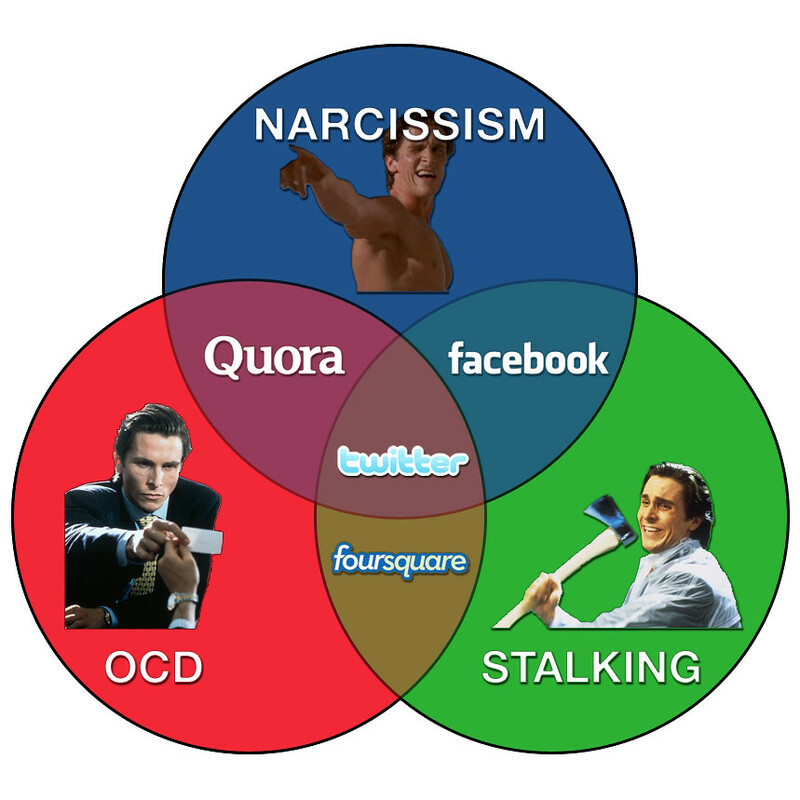 Social Networking Venn Diagram. 2011 update! So we’re upgrading our DespairWear for the new year! Social Networking in 2011 is neither social nor networking. Discuss. …and Twitter is the one ring to rule them all. It matters not if you’re a panda or a whale. Facebook forces me to bring all of my friends and interests with me wherever I Connect, like Yoda riding my back telling me what to do, grammarlessly and ceaselessly. Twitter has no memory and as a result is useless if I want to have an actual conversation. The community and content have nowhere to continually improve but elsewhere, so Twitter will always exist as exhaust. Zynga is the Chuck E. Cheese’s of the Internet: I buy phony currency with real money to play games I won’t care about in a year to earn tickets redeemable for stuff that does not move my life forward or contribute to my genuine happiness. Foursquare and Quora combined have fewer than 10 million users. Compared with the size of the Web, that rounds to zero. The world can do better. The future of social networking is waiting to be invented. But first, we meditate on the nature of being human. In Kushinagar the trees lower their blossoms on the Buddha’s death bed. Life is a river always moving. Do not hold onto things. Social networking, we’re ready for a change. This morning I woke up thinking about true happiness. In other words, the spice must FLOW! So today, 1/11/11, at 11:11am, Troutgirl and I are incorporating PandaWhale. That’s right. It goes to eleven. We at 106 Miles want to bring our cocktail party online. PandaWhale is writing the software to make that happen. To learn about saving the Web, see Tim Berners-Lee. We want to do our part to Save the Web by organizing public conversations among the members the 106 Miles community, so that our conversations are searchable, lurkable, and transactable across the Web. P.S. — If I don’t answer your email, it’s because I’m busy. Please keep pinging me if it’s important. Thank you! And till we ship, you can join 106 Miles on Meetup.